The minimum recommended width for bifold doors is 1400mm in total. However, this is the minimum width for a set of bi-folding doors with 2 door panels. So, the minimum width for an individual door panel is 700mm. Emerald recommends that you don’t opt for anything much smaller than this, or the doors might bind upon closing. Additionally, this might also prevent you from having a usable traffic door. 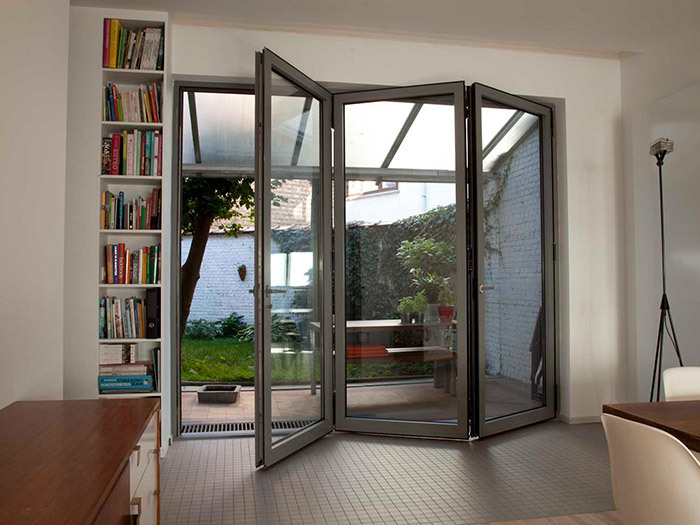 A traffic door is a conventional door that operates independently so you can transition between areas without moving the whole set of bifold doors. What is the maximum width for bifold doors? The maximum width for an individual bifold door panel is 1.2m. However, the maximum overall width for a set of doors is 7m. The frames should also take up approximately 5 to 10cm, which should be taken into account when calculating the expected width of the doors. What is the minimum height for bifold doors? Bifolds can be manufactured to a minimum height of 1600mm. Much smaller than this, however, and they’re considered a folding window. Conventional doors are around 2100mm in height so bear in mind that 1600mm is half a metre shorter than this. Otherwise, any taller inhabitants or guests might struggle to get through them! 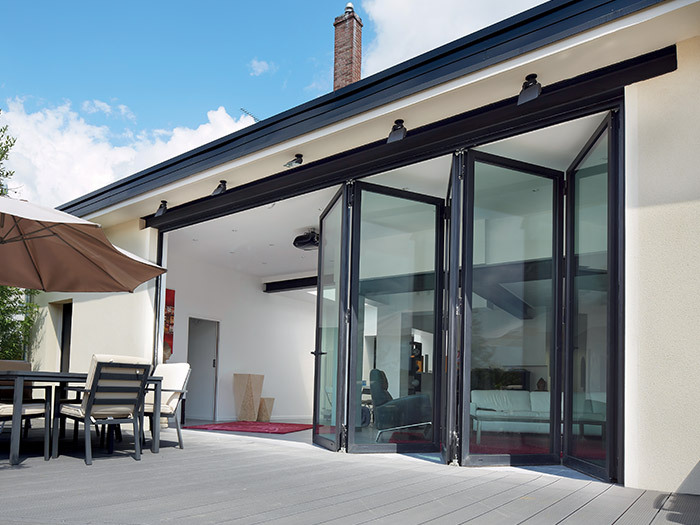 What is the maximum height for bifold doors? A set of bi-folding doors is available in a maximum height of 3m. Although, Emerald does not recommend manufacturing a bifold to both the maximum width and maximum height. This is because functionality might be affected. What configurations are available with bi-folding doors? Up to 38 different configurations are available to choose from, with the number of door panels ranging from a minimum of 1 up to a maximum of 7. The number of panels you can have will depend on the size of the aperture. However, if you’re looking to quickly move between areas of your home, a set of bifolds with 2 panels is not the most convenient. This is because there’s no way of incorporating a traffic door. So, unless you have another door that is convenient to use, opting for 3 panels or more is wise. In terms of opening, you can choose whether they open out or in. Or, all doors can fold to the left or the right, or they can be split to fold both left and right. There are also four different threshold options available to choose from, including ultra-low, to suit a variety of access requirements. Bi-folding doors have a choice of handles which are available in a number of finishes too. Here at Emerald Windows, we install low maintenance, ultra-durable aluminium bifold doors that achieve U-values of 1.8 W/m2k. When purchasing a set from us, we’ll carefully work with you to learn all your requirements and ideas. From here, we can advise you on they should open, the number of panels and whether to go for narrow leaves or wide. Interested in a set for your home? Give us a call on 0800 612 4154 or contact us online. Category: Doors, Guides. Bookmark the article.